The first two practice sessions at Indy showed that McLaren still have an edge on the rest, although it is less here than in Canada and Monaco. The Ferraris were very close, Massa retaining the quickest time in P2 until fairly late in the session. But both Alonso and Hamilton, in that order, grabbed the top spots in the end, making it look easy as they did so. In contrast, the Ferraris looked difficult to handle, Raikkonen in particular struggling to keep the Ferrari on the road. 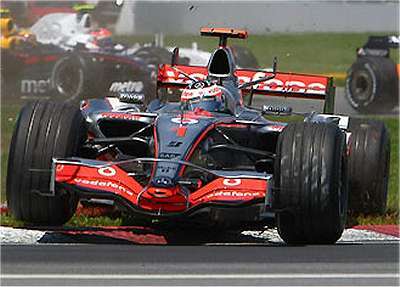 Friday practice is usually an unreliable guide to form but, even so, it seems that McLaren are still the team to beat. In fairness, it must be said that the slippery surface was very unpredictable and almost everyone had the occasional trip across the grass. But this is traditionally a Ferrari circuit and their performance does not argue for a close race on Sunday. Their battle may well be with the BMWs of Heidfeld and Vettel (who was immediately quick and kept his car on the road - an impressive debut). If they can persuade some longevity into their new seamless-shift gearbox, the Red Bull drivers might also be fighting the Ferraris. Coulthard had his best practice session in a long time, finishing sixth fastest, while Webber may have gone faster than twelfth had his car lasted a bit longer. The Renaults obviously hated the track and it was Kovalainen who managed to extract a decent time from his car in the end, leaving Fisichella puzzled and frustrated in 15th. It was a practice of wildly differing fortunes amongst team mates in the midfield, Rosberg hauling the Williams up to 7th while Wurz languished in 16th, and Liuzzi getting the Toro Rosso into the top ten for a while but settling for 13th in the end; Scott Speed had various problems with the car and could manage no better than 18th. The two Hondas grabbed 9th and 10th fastest but one wonders how much this was due to low fuel runs. The car is slow through the speed trap and that makes a big difference at Indy. Super Aguri struggled a bit, Davidson the quicker of the two, and Toyota confirmed their awful form, Trulli in 17th and Ralf playing amongst the Spykers. No doubt there will be some changes come the qualifying today. Most will be minor re-shuffles but Toyota must surely improve, mustn't they...?